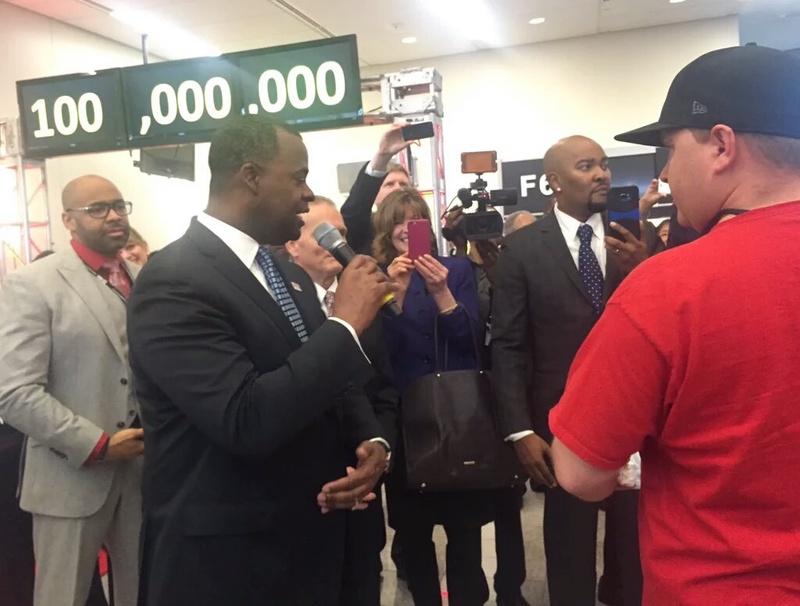 Atlanta - Hartsfield-Jackson Atlanta International Airport said it hit a major milestone Sunday. The airport that calls itself the world’s busiest announced on its social media sites said it served its 100 millionth passenger this year. That makes it the first single airport to serve that number of passengers in one calendar year. The passenger earning the distinction is Larry Kendrick of Gulfport, Mississippi, who will receive a Nissan Altima, two free Delta round trip plane tickets and a $500 gift card. Atlanta Mayor Kasim Reed welcomed a surprised Kendrick, who walked down a red carpet as journalists and onlookers recorded the moment. Hartsfield-Jackson general manager Miguel Southwell says the airport had a 5 percent increase in passenger counts this year.